As fate would have it and through many years unbeknown to me, the mysterious Maya King known as Pacal Votan has secretly occupied a place in my life. Albeit for all these years he’s simply been an object of decorative art in my home and it was not until recently that I was re-introduced to this all important Maya King. He plays a significant role in our shift into the next world age in Mayan chronology on the winter solstice of December 21, 2012. 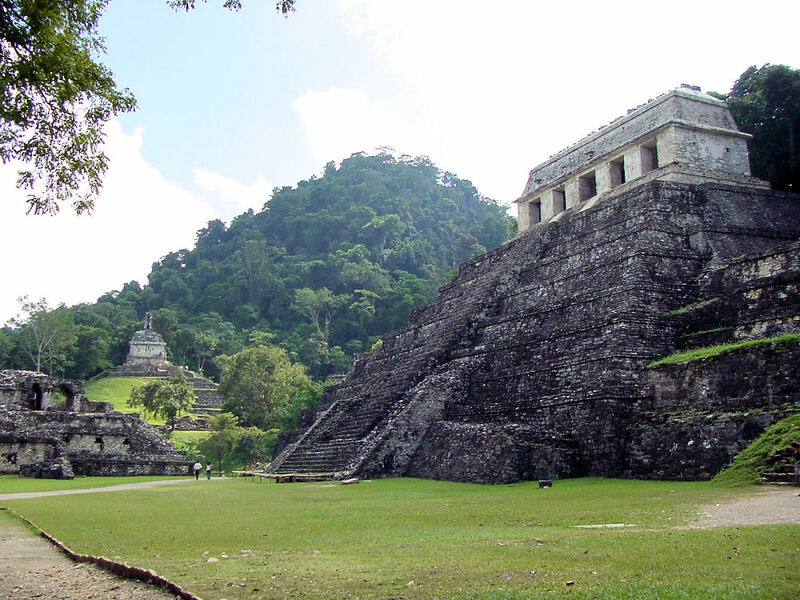 Pacal Votan was the ruler-king from 603-683 BC in the glorious city of Palenque in Chiapas, Mexico. He is revered as the chief engineer that guided the Maya through their inscriptions on stone monuments and temples with very precise astronomical and astrological information. My initial encounter with Pacal Votan happened much further away while on a trip to beautiful Chichen Itza. 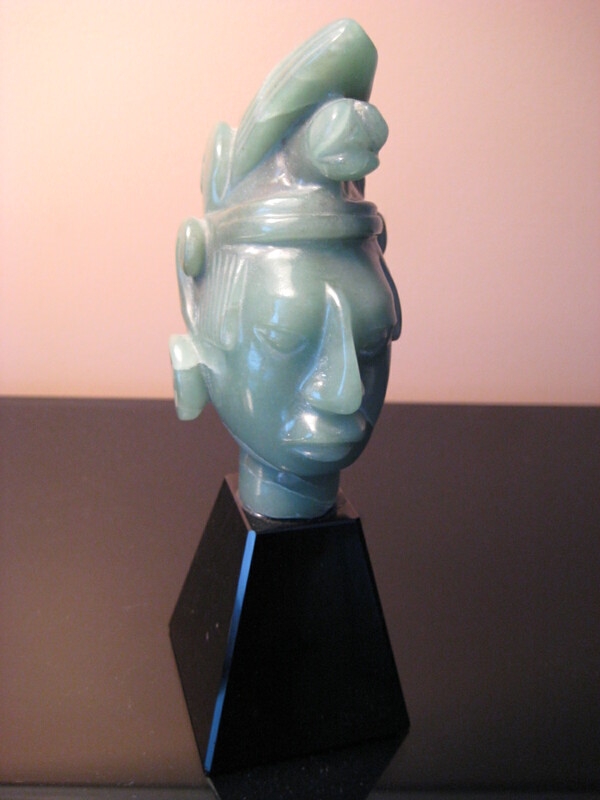 Always one with an eye for uniqueness, I was drawn to purchase a bust carving made of jade and situated on a base of black onyx. The only thing I knew at the time was it represented just another Mayan king like many before him and those few remaining after him, and would return fond memories of that fascinating trip. Fast forward to 2010. While researching the Maya calendar and time systems specifically the Long-Count version where the 2012 date originates and signifies the end of this particular world age, I came across an image of Pacal Votan. I was pleasantly surprised recognizing the face and immediately and retrieved the carving for a closer look. Yes, it was a representative image of the King himself and it now occupies a special place upon my desk even as I write this post. While simply being another Maya king and that is still true today, the significance and wisdom of Pacal Votan and what he spoke about the time leading up to 2012 cannot be discounted. A quick step back in time to the city of Palenque reveals an amazing archeological discovery that took place while excavating on the site. A Mexican archeological team in 1948 lead by Alberto Ruz Lhuillier first discovered a plaster tube beneath the stone flooring in a room on top of the Temple of the Inscriptions. This plaster tube is known as the “Earth Spirit Speaking Tube” a conduit that is said Pacal Votan used to communicate with the living. It follows the once hidden 69 steps down into the entrance of the king’s tomb inside the pyramid. After four years of excavating into the Temple of the Inscriptions, they found Pacal Votan’s sarcophagus and body. And what a discovery it was. Ruz said it was both awesome and mystical, because he knew that burial chamber had been untouched since 692 AD. He said he could feel the breath of the last people who closed that door. If it had not been for the tube, that tomb may not have been found! 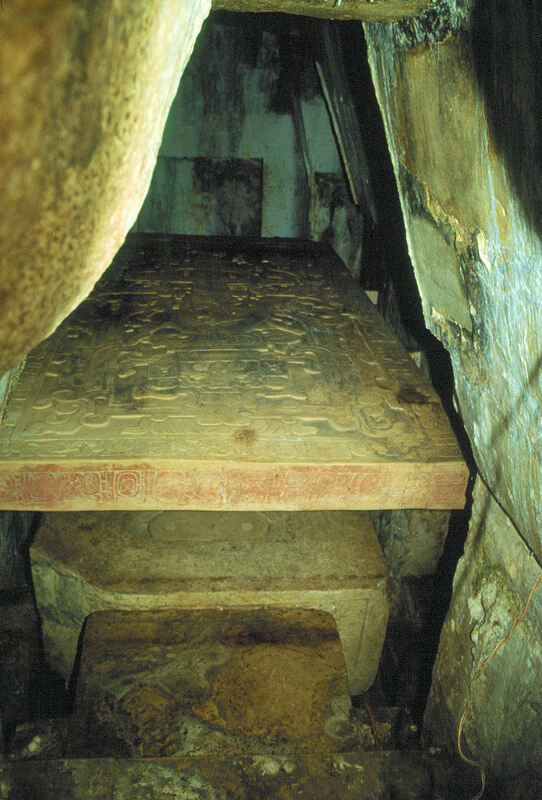 I believe it was this special tomb the only one known to have been hidden by the Mayans inside a temple, and its unique sarcophagus lid that became famous after being brought into public light through the writing of Erich von Daniken in his 1968 book- Chariots of the Gods? Unsolved Mysteries of the Past. The now famous sarcophagus lid depicts what many today see as someone commanding a type of vehicle. 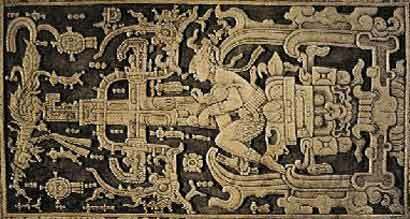 The Mayan academic community believes it only represents Pacal descending into the mouth of the Underworld. There is much more knowledge being revealed through the elaborate carvings on the lids surface. The debate and opinions concerning the “space craft” or vehicle theory continue to this day. Lord Pacal died on March 31, 683 at the age of 80. He resided as king near the end of the Classic Period, from July 29, 615 A.D. assuming the throne at an incredible young age of 12 and ruled for 68 years. I’m a person fascinated by the likelihood that mathematics (aka Sacred Geometry) govern the known universe; so, whenever I notice similarities or synchronicity involving numbers I cannot hide being at least amused. Some quite interesting dates and time-lines that carry allot of meaning surround Pacal Votan’s burial, 2012 and the subsequent discovery of his resting place. Even with the pyramid construction progress on the Temple of Inscription above his tomb, somehow Pacal Votan prior to his death could see forward into linear time enabling him to communicate a profound message of time so accurate it defies left-brain logic. Although Pacal Votan died in 683, nine years went by until his tomb beneath The Temple of Inscriptions was dedicated and sealed in 692 AD. Between 692 and discovery of his tomb in 1952, 1,260 years had passed. This number- 1260 is a very significant as an indirect, even subliminal message referring to man-made artificial time. Without diverging greatly, the Maya where masters with date keeping and did so through natural means using celestial mechanisms primarily lunar and solar observations that are so accurate they only need adjustment once every 100,000 years! Contrary to natural timekeeping, today through our use of the Julian/Gregorian calendar and all our technological advancements, we have lost our powerful connection with creation so much that we still do not fully understand our handicapped nature. Pacal Votan knew this was to occur and wrote of just a world in which we find ourselves today in the closing days of the Mayan 5th world age. More about the cause and effect later, but first we need to grasp the language of time, its cycles, and a prophetic mathematical message as conveyed by Pacal Votan. 12:60 can be viewed as a direct reference to our artificially fabricated man-made 12 month calendar and mechanical, 60 minute hours which have led our world forward since Julius Cesar introduced this calendar in 46 BC. This calendar or more precisely, “clock” was the first machine and the basis for all machine technology to come. It seem fitting that this number, 1260 would blatantly appear in the time line of Pacal Votan as it identifies with the western world’s chosen date keeping method at the time the temple was constructed and the tombs discovery in 1952. Another, special number appears as well and refers not only to Maya natural time keeping methods, but also the year 2012. Between 692 AD and 2012 the closing of the Mayan 5th age, (see this post) there are exactly 1,320 years. For most, this number quite frankly is meaningless. However, upon closer look at events, an amazing message appears. From Pacal Votan’s tomb discovery in 1952 to 2012 there is just 60 years remaining. When you add the 60 years together with the 1,260 years the tomb was hidden, you again get that special number- 1,320 years! By the way, this is the same number encoded in the mathematics of the Mayan Long-Count calendar 13:20- 13 baktuns (144,000 days), consisting of 20 katuns (7,200 days) each; the entire 13 baktun cycle is to be completed in 2012. This to me is far more than coincidence as everything was in perfect timing, precisely as foreseen by Pacal Votan and he left nothing about the tomb’s message of time to chance, not even its discovery. Just as 12:60 is representative of something man-made that is, limited 3 dimensional time, 13:20 is representative of natural time or the Law of Time, a cosmic 4th dimensional existence. This is the world in which not only the Maya but many other indigenous cultures existed in long before man’s attempt to permanently alter natural laws with the introduction man-made time. In other numerical terms, 13:20 can be associated with the 13 annual cycles of the moon and our bodies have 13 major articulations- ankles, knees, hips, wrists, elbows, shoulders and the neck. You can also add 13 + 20 and arrive at a master number of 33 which is also the number of vertebrae in the spine. Let’s not forget the 20 fingers and toes, together all these symbolically connect Heaven and Earth. To the Maya, 13:20 was a very important ratio as it was also reflected in one of their master calendars called the Tzolkin. Interestingly, this calendar had alternate meanings like- “pieces of sun” or “day-count of vibrational tree-consciousness”. This Tzolkin calendar although not based on the movement of heavenly bodies, describes all the energies of Creation (260 of them, 13×20) as they daily move along through cycles within cycles. Again, all based on a 13:20 ratio that permeates the entire Mayan natural time keeping system and as we have just seen, the famous Long-Count calendar. 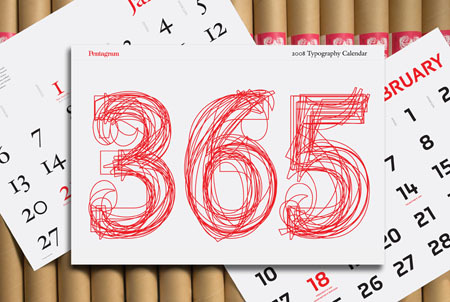 In this 260 day calendar, there are 13 months of 20 days and it included 20 weeks consisting of 13 days each. With both man-made, 12:60 time and universal, 13:20 natural time codes present within Pacal Votan burial, tomb discovery and the 5th age conclusion on December 21, 2012 this could very well be a valiant attempt by Pacal Votan to validate and express a simultaneous convergence of differing existences finally colliding in our time. One could say living in a 12:60 time-line is to be assured of limitation where living in 13:20 a universal, cosmic time-line is to embrace limitlessness and non-separation that exists in all of creation. This is an intriguing way to conceptualize the Maya’s 2012 message that we are intimately linked together and all of life is ordered by re-occurring cycles of time and their associated patterns within all creation. We are now closing out the most important time cycle, our own solar system’s ~26,000 year Galactic realignment with the source and center of the Milky Way Galaxy on or around December 21, 2012 that coincides with the close of the Mayan’s 5th age and their 13th baktun which began 5,125 years ago in August, 3114 BC. (For more insight see this article) Our infinite, interconnectedness with all of creation is the Mayan’s primary message regarding 2012. We can only go through this opening doorway by living a synchronistic way of life that is in absolute harmony with all creation and this dimensional doorway is represented by natural, cosmic time. So what did Pacal Votan speak about these days of this cycle we now live in? For starters, he said that mankind would disconnect from the laws of natural order through the use of artificial time and become addicted to materialistic values becoming ignorant of our sacred interdependence with nature, that is- all of creation. This current 5th world cycle is known both as “the triumph of materialism” and “the transformation of matter.” How fitting are those descriptions in this closing age of time. I believe we have accomplished both and now find ourselves awakening to the fact that something much greater and very important to our survival has been missed or unknowingly discarded along the way. Pacal also understood that mankind would have to awake from a state of amnesia to regain our conscious connection to a universal natural, 13:20 cosmic time of synchronicity and by adopting it, would become no longer spiritually bound by a restrictive, materialistic centric 12:60 mechanized time illusion. Truth be told, time is not money, time is art. Even to the casual observer it is easy to see that with the invention of the clock, it gave birth to the false idea that time is outside us. 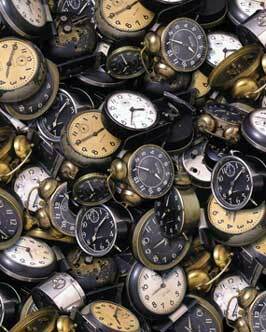 It’s as if time is something we can observe like daily blocks on a calendar or tick-tock of a clock that fly by in a linear fashion totally devoid of the natural, organic process of life that goes on without interruption and without artificial time. I suspect this disconnection to natural time and the rhythmic cycles of creation is a primary means for our current inability to access the higher self and our inherent inner technology with ease and grace. To clarify what Pacal Votan mysterious message of time is saying to us can easily be seen through what happened at the beginning of the 13th and last baktun of the Mayan calendar. The final 13th baktun cycle began in 1618 and ends in 2012. As we entered this final cycle of time, it was right after the introduction of the 12-month Gregorian calendar system in 1582 by Pope Gregory XIII. It was also during the early 1600’s when the accuracy of mechanical clocks were finally perfected. Between these two instruments and their combined use is what catapulted humanity headlong into the birth of the scientific revolution and materialism governed by mechanized time. Of course without these tools the industrial revolution and all our technological advancements could not have taken place; yet between the Maya and Pacal Votan time prophesies they verify this world age like others prior is ending right on “time” giving way to a new paradigm. We can no longer expect to continue at the exponential speed at which our technological progress is unfolding without attaining a corresponding level of wisdom and expect to avert disaster. Business as usual is a blind path; just look at the crossroads of choice we face today. 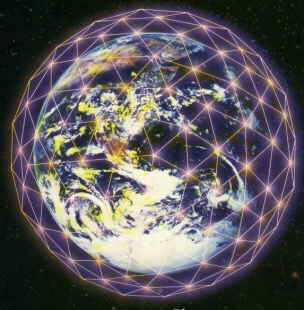 There is no reason why we cannot transition out of our present condition on this wonderful planet with the proper use of specialized technologies and our own internal, divine technologies to create “Heaven on Earth”. ← Sovereign Debt Debacle- Coming to a Country Near You? Curious. That number figures in the book of Daniel, also. That is a very good point. Many that have studied the Torah and the New Testament have not made this obvious external, related connection as they do not dig deep enough outside of their self-imposed dogmas. It is my contention that linear time as we currently live, runs a definitive course/cycle and is mathematically provable. One cannot easily dismiss what indigenous peoples of the world have spoken of; nor should we discard valid messages from any source. The Struggling Class – The emergence of consistent poverty. Baseline Scenario The Baseline Scenario is dedicated to explaining some of the key issues in the global economy and developing concrete policy proposals. Credit Writedowns Credit Writedowns is a news and opinion site dedicated to bringing a well-informed view of finance, economics, markets, and foreign policy into the mainstream consciousness. Divine Cosmos David Wilcock is a professional lecturer, filmmaker and researcher of ancient civilizations, consciousness science, and new paradigms of matter and energy. Swarm USA This website holds the keys to ending the financial crisis ruining our country. With your help, we will force Washington to end our debt-based monetary system and return control of the government where it belongs – We The People. The Centre for Research on Globalisation The Centre for Research on Globalisation (CRG) is an independent research organization and media group of writers, scholars, journalists and activists. Feeling for Healing Patti Ortyl is a Reiki Master/Teacher and Psychic Medium. Patti holds a Ph.D. in Esoteric Philosophy and Hermetic Science from The Ritberger Institute in California. My Astro Chris A the Modern-day Maji who reads the stars. What are the celestial powers saying to you now? Two Dots Marketing (2Dots) A progressive, fun, draw-outside-the-lines marketing company.